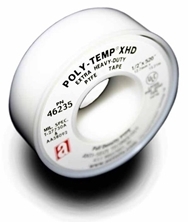 Poly-Temp® XHD is our highest grade of PTFE tape, extra thick and extra density material. Meets the Government Spec CI.D. A-A 58092. UL Listed, Recognized Component and ULC Poly-Temp® Thread Seal Tapes are 100% PTFE from the highest quality resins available. This universal thread sealant can be used on all types of metal or plastic pipe connections and effectively seal a vast array of chemicals. Suitable for oxygen systems.